History: Kieran has been around the food industry for as long as he can remember. His father was a chef, owning restaurants and food outlets in Darwin, and Kieran recalls spending many a weekend helping out in the kitchen. When old enough, he went to Sydney to do his apprenticeship. Once qualified he was keen to explore Europe and experience classic French and Italian food first hand. After two years honing his culinary skills abroad he returned to establish himself in the Sydney restaurant scene. A desire to be closer to family (and to start his own) led him to make the move to Queensland. After a career spent opening successful restaurants for others, in 2007 he felt ready to take the next step and move into restaurant ownership himself. Kieran joined forces with a former work colleague, restaurant manager and sommelier Stephen Heffernan, and they combined their skills to convert a charming old Queenslander into an award-winning fine dining restaurant. Reserve Restaurant Cellar is now one of Queensland’s premium dining establishments, acclaimed for its classically styled menu and state-of-the-art wine cellar. 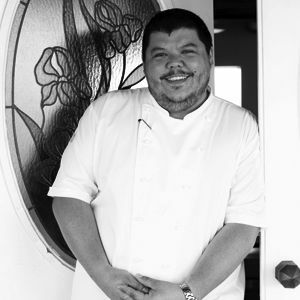 Following the success of Reserve, Kieran has opened another restaurant at Twin Waters on the Sunshine Coast - The Loose Goose, which he co-owns with Stephen and another chef, Carl Mitaros, who heads the kitchen there. Contemporary Australian with a classical French influence. The cellar at Reserve Restaurant underpins everything we do. I look for flavour sequences that marry well with wine. At Reserve we are always looking for new and creative ways to serve classic combinations. In the cooler climate of Maleny, I look for depth and work to create flavours that are layered while still being subtle. Cleanliness, fingerprints on plates, and clutter. Being able to create a sensory experience that people will remember and talk about with fondness for days, months and even years.